Sentinel X500 Inhibited Anti-Freeze at PlumbNation provides protection against scale and corrosion in all types of indirect heating systems, including those containing aluminium components, whilst preventing freezing. Sentinel X500 is effective at preventing hydrogen gas production. The dosage of Sentinel X500 Inhibited Antifreeze will depend on the level of frost protection required. 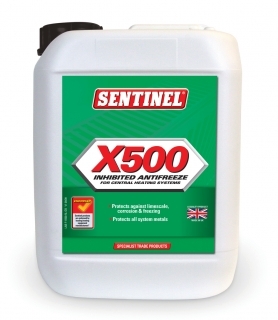 20L of Sentinel X500 added to a typical domestic system of 8 to 10 radiator panels will provide the minimum concentration of corrosion and scale inhibitor and also protection from freezing down to approximately -6°C. 40L will provide protection to -20°C. The product is not suitable for heat transfer circuits of solar energy collector panels in which temperatures may exceed 200C or be subject to periods of stagnation.